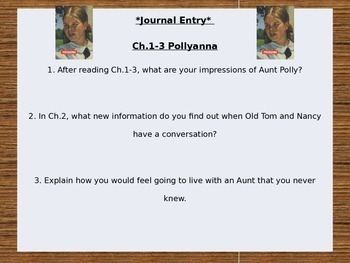 This is a 9 slide PPT presentation that includes 8 journal entries over the classic novel Pollyanna by Eleanor Porter. The journal entries are for every 3-4 chapters in the book and include 3 questions per slide. Display or print these questions for students to answer in their literature response journal or use them to guide your discussion over the book. Enjoy!